Head over to american magazine Flood, to see the new music video “The Other Side” from Public Service Broadcasting. 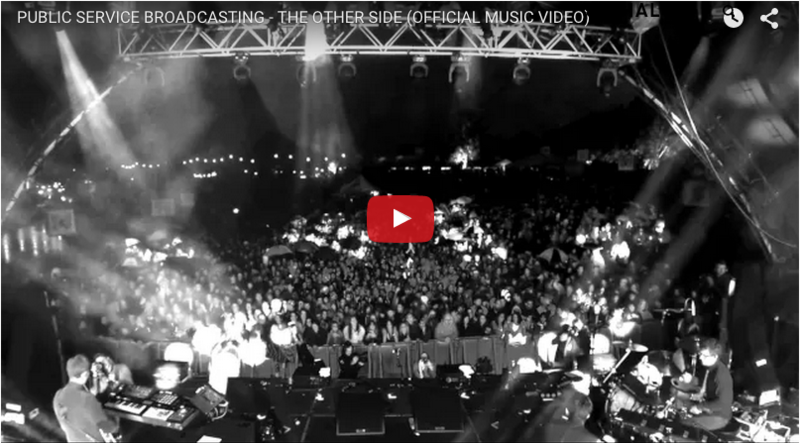 The third single from their second album ‘The Race For Space”, the new video consists of live footage filmed at Secret Garden Party earlier this summer. Following on from singles “Gagarin” and “Go, “The Other Side” has been playlisted on BBC 6 Music so if you haven’t heard it yet – you soon will. Freshly signed to Xtra Mile Recordings, Will Varley has announced that his new album will be released on 30 October 2015. 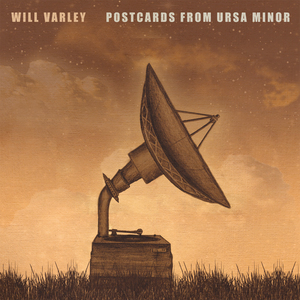 Entitled ‘Postcards From Ursa Minor’, the LP will be available in an array of formats including vinyl, MP3 and CD. Produced by Tristan Ivemy and mastered at Abbey Road by Frank Arkwright (Arcade Fire, Blur), the release is a tongue in cheek look at human existence on a lonely planet. For a sneak peek of what is in store, you can stream track ‘Is Anybody Out There’ now here. Its a double bill (technically a triple bill) of tour announcements today, with both Molotov Jukebox and DJ Format & Abdominal announcing their separate headline shows around the UK. The triple bill but comes in as excitingly, roster mates The Church will be joining Molotov Jukebox as their national support act… Both tours go on-sale this Friday at 9am. Please see information below. With fans flocking across the country to see Abdominal and The Oblique’s UK tour earlier this year, it was clear as day that the MC sidekick of DJ Format is still renowned as ever for his unique sound and delivery. A huge highlight from each show was when he and his band performed a string of DJ Format & Abdominal tracks to rapturous applause and it was moments like these that cemented the idea of getting both DJ Format & Abdominal back together and touring the UK again – something that hasn’t taken place for over 10 years. With a headline show confirmed at London’s prestigious Jazz Cafe in Camden on the 22nd November, the duo will be traveling the length and breadth of the UK on a 12-date tour throughout the month of November taking in shows in Brighton, Bristol, Manchester, Edinburgh, Glasgow plus many more. 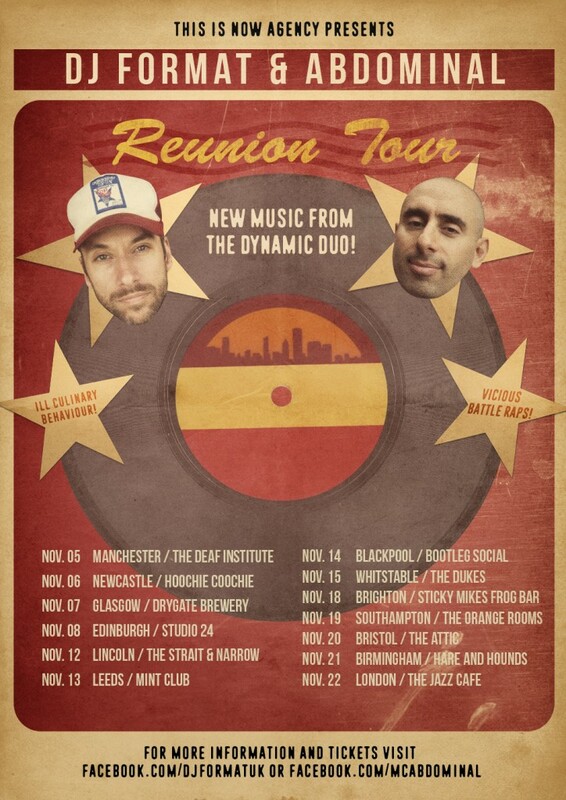 Both DJ Format & Abdominal have been busy over the past decade releasing music and playing shows around the world but it is this reunion tour that fans have been waiting for. Alongside new material to be premiered at the shows, huge hits like ‘Ill Culinary Behavior’, ‘Vicious Battle Raps’ & ‘Ugly Brothers’ taken from the albums ‘Music For The Mature B-Boy’ and ‘If You Can’t Join ‘em.. Beat ‘em’ will sure to be played to packed out venues, making this reunion tour one of the hottest tickets in the Hip Hop calendar this year. After a summer of festival appearances, Molotov Jukebox are returning to the UK touring circuit for an exclusive six date tour showcasing their forthcoming second album ‘Tropical Gypsy’. The London based six piece will be stopping off in Birmingham, Manchester, Glasgow, Brighton, Bristol and London across November and December and will be joined by special guests The Church, who will guarantee to start each event off on the right foot with their all singing, all dancing, party church service. In between show stopping performances at this years Glastonbury, WOMAD, Nozstock and Larmer Tree festivals, Molotov Jukebox have been busy crafting their second album and, after the fantastic response to the first single ‘Hi Life Crisis’, its already easy to see that the LP will be well received amongst fans and press alike. With the spellbinding Natalia Tena on lead vocals and accordion, Molotov Jukebox have grown a faithful following across the globe with their unique take on the Balkan and Gypsy sound, which has been at the forefront of the party and festival scene for many years. You can personally help make Tropical Gypsy a success by taking part in Molotov Jukebox’s Pledge campaign via www.pledgemusic.com/projects/tropicalgypsy. Head there now for exclusive content, to see how you can get involved and the featured items available for pledge. If you want to join the party then tickets can still be bought here.